A chance email from a mom looking for a good children’s book for her new interracial family, prompted me to buy and read this charming illustrated children’s book. Sometimes the message of equality can be offered even to very young readers, if it is done gently and quietly, as this lovely book does. It also reminded me that as part of my commitment to highlight social issues in an appropriate way for young readers, even the youngest children can be included. A simple children’s book like this begins the process of opening hearts and minds to the beauty of diversity at an early age. What I would love most for all children is to grow up, not color-blind, but seeing all the differences in the world, and loving them all. 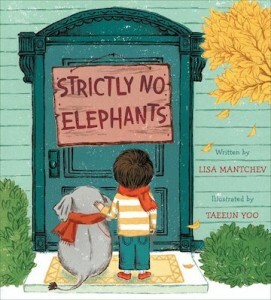 “Strictly No Elephants” makes the point using animals as the metaphor, which to me is the best way to method for young children. Why do fables work so well? They bring messages without directly challenging the younger child. Most of all, this is just a sweet and simple story, even if it didn’t have an important message. Everyone is always welcome.